Epson America, Inc., a leading supplier of value-added Point of Sale (POS) solutions, recently announced that Upserve, provider of a full-solution restaurant management platform, has adopted the Epson TM-m30 receipt- and TM-U220 kitchen printers, along with Epson’s Kitchen Display Systems (KDS) Controller solution with the OmniLink TM-U220-i, intelligent series and KDS expansion modules, for its complete line of POS products giving its customers more choice and flexibility.The joint solutions are available now with Upserve’s new Android POS through Upserve solutions representatives and their digital hardware store. Upserve is a restaurant management platform that provides POS, analytics, payments, online ordering, menu trends, and inventory solutions to nearly 9,000 restaurants. 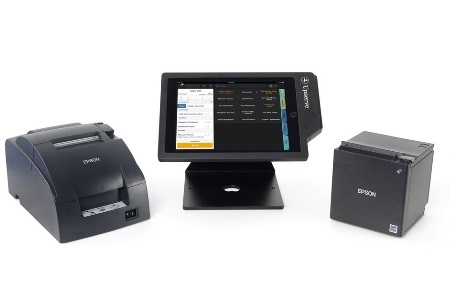 The company's cloud-based platform exclusively works with Epson’s TM-m30, TM-U220 and KDS controller solution, which supports touchscreens or kitchen monitors with bump bars, along with Upserve’s fully integrated EMV solutions designed specifically for restaurants. The integrated solutions enable quick and easy printing of checks, kitchen tickets and order management while helping facilitate chip-enabled payments. Upserve is the magic ingredient that helps restaurateurs thrive, with everything they need to successfully run a restaurant in a single hub. Upserve offers the market-leading cloud restaurant POS, actionable analytics, transparent processing, automated inventory and ordering, mobile restaurant management, and seamless integration with leading third-party restaurant apps via the Upserve Marketplace. Nearly 9,000 restaurants use Upserve to manage relationships with more than 57 million active diners, process over $10B in annual sales, and serve over 36 million meals per month. Upserve is headquartered in Providence with additional offices in Denver, New York City, and Tel Aviv. For more information, visit www.upserve.com.